The most fascinating single scene, for me, was the one set in the bizarre saloon on the planet Tatooine. As that incredible collection of extraterrestrial alcoholics and bug-eyed martini drinkers lined up at the bar, and as Lucas so slyly let them exhibit characteristics that were universally human, I found myself feeling a combination of admiration and delight. In previous science-fiction films, alien visitors were generally clad in matching silver jumpsuits and were of the same species, and usually pretty stiff. The cantina scene in Star Wars, on the other hand, features aliens of all shapes and sizes co-mingling in a very relatable environment, driving home the concept of George Lucas’ lived-in universe. Drinking with friends is a universal activity, and that brought the galaxy, far, far away down to earth. Thus, the bar scene in Star Wars became a pop culture phenomenon, inspiring a CBS sitcom described as “an interstellar combination of Fawlty Towers and Casablanca,” countless parodies and homages, and even a drunk driving P.S.A. The Richard Pryor Show only ran for four episodes, but since those four episodes aired in 1977, there was bound to be a Star Wars sketch. Pryor is arguably a one-man show here as he riffs off of mute alien characters, but the clip is most notable for using actual creature masks and costumes from Star Wars. Momaw Nadon (Hammerhead) is there, and there’s a Duros and a Shistavanen in a sport coat stolen from Dr. Zaius. The “Star Wars Bar” resembles the Regal Beagle more than the Mos Eisley cantina, but the most outdated thing in the sketch isn’t the English pub style that was trending in the late ’70s, but all the smoke. Presumably, Pryor’s place is the after-hours spot everyone went to on Tatooine after Bea Arthur tossed everyone out from Chalmun’s at 2 a.m.
“Loverboy” was the second single off of Billy Ocean’s Suddenly album. Released in 1984—seven years after the success of the original Star Wars—the music video paid homage to the famous cantina sequence featuring a few really tall Jawa knockoffs as well as aliens and assorted creatures that wouldn’t look out of place in Battle Beyond The Stars or any Jim Henson rip-off from the early ’80s. While the aliens party in the interstellar speakeasy, Ocean appears to be shirking his responsibilities, singing and dancing instead of getting those moisture vaporators up and running. The denizens of Chalmun’s may have been part of a wretched hive of scum and villainy, but don’t let anyone say they didn’t drink responsibly. 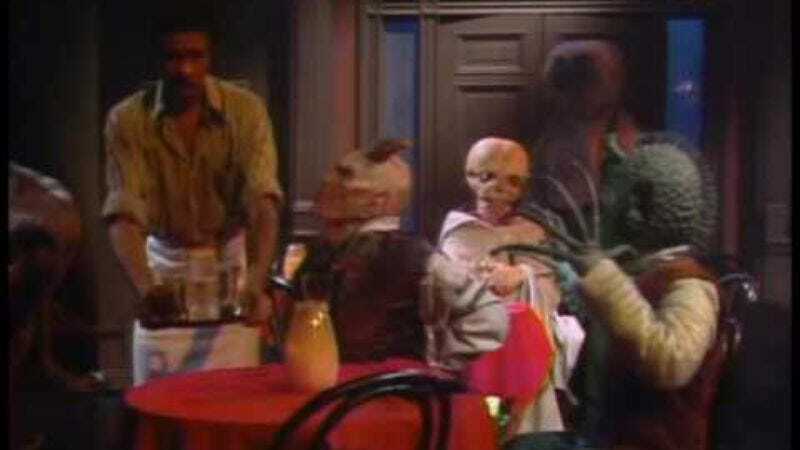 In this 1979 P.S.A.—which is presumably no longer canon—an over-served Talz is helped out of the cantina by a Durosian friend, possibly cruising over to Richard Pryor’s place. Friends don’t let friends make the jump to lightspeed while drunk, though. It should be noted that while the cantina is filled with smoke, C-3P0 feels that smokers are jokers. Despite its legacy, George Lucas was never satisfied with the outcome of the cantina scene in the original Star Wars. Because of a relatively low budget, the filmmakers were forced to use off-the-rack masks from Rick Baker’s studio, such as the two space werewolves that the director excised from his 1997 Special Edition. Lucas attempted to recapture the magic of the cantina sequence twice in Attack Of The Clones, which featured both a Coruscant club that resembled an even more low budget version of Quark’s Bar, Grill, Gaming House, And Holosuite Arcade and a diner that felt as out of place as Lando Calrissian showing up at Mel’s Drive-In. Mos Eisley cantina was known around town as being a little rough; plenty of criminals and murderers were regulars there, but for most fans, the most heinous crime committed at Chalmun’s was the showdown between Han Solo and Greedo being altered by George Lucas. The original cantina sequence lives on through a shoddy 2004 DVD release, ancient VHS copies, and numerous fan edits and restorations, but even some of the Star Wars faithful may have never seen this rough cut of the sequence, which once and for all should prove that Han didn’t shoot first, he’s the only one who shot.